September is Baby Safety Month! We do everything we can to keep our babies and toddlers safe and bath time is no exception. We all remember those first few weeks home with our newborn babies. We took the months of preparation in anticipation of our new little one to research how to care for a baby, how to keep them safe and healthy and even how to care for ourselves in order to best serve our babies. When it comes to newborn bath time, the utmost care is put into every detail to make sure our baby is safe, comfortable and that their new skin is carefully cleaned. As they grow, we become more comfortable bathing them and let go of the nervousness and fear as we take in the joys and memories of such a precious time. My little ones love bath time and savor every second of it, sometimes begging to stay in even after the water has cooled off. They play and splash, help to wash themselves and even pretend to swim. Our bath time is always so fun, but I still treat it with the same care I did when they were newborns. We can sometimes forget that even though our toddlers are more stable, able to move better and even put their face in the water safely that toddlers are also faster, wigglier and more daring than they used to be. Accidents can happen just as easily as with a newborn. Luckily there’s simple steps you can take to be sure that bath time is as safe as it is fun! Having everything set and ready for bathtime will set you up for the easiest and safest time for you and your toddler. Making sure that all that you will need for bath and after are right on hand in the bathroom with you keeps you from having to possibly leave the room to go grab something as simple as a towel or some toys. We make it a part of our routine to list the things we need as we head to the bath. 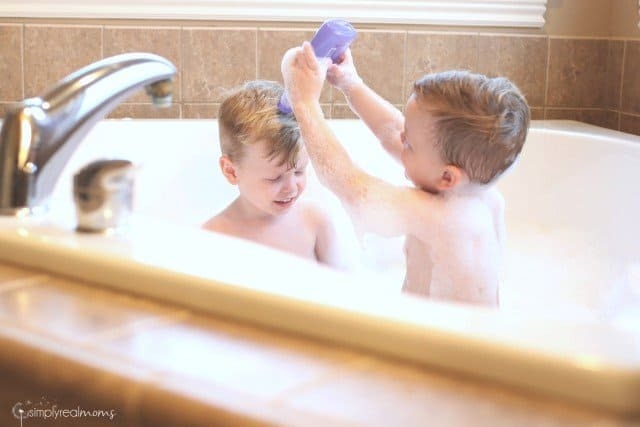 The kids like getting involved and on even my craziest days it helps me to remember everything I need for bath time! Just like newborns, you need to be sure that the water temperature is comfortable for a toddler. It’s best to run the water and then shut it off before putting your toddler into the tub. 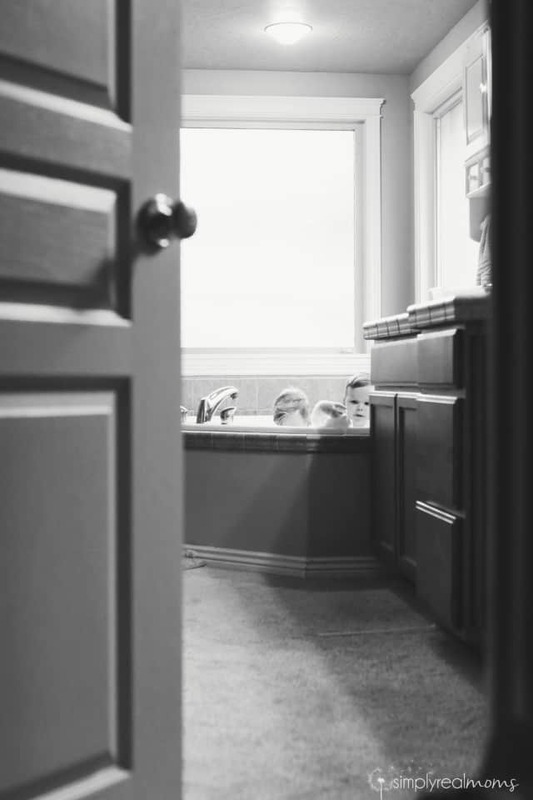 Water can change temperature as it runs sometimes and if your toddler is in the tub they can be hurt by scalding water. A trick I use is to turn the water to cold before shutting it off as well-this way, if your little one turns the water on themselves, it isn’t immediately hot. We have a strict rule of no standing in the bathtub but of course the second I turn my head my two toddlers are standing up for one reason or another. Bathtubs are so slippery and a fall could really hurt or injure your child but a simple no-slip mat can prevent that! Don’t have a mat just yet? Place a towel on the bottom of the tub! 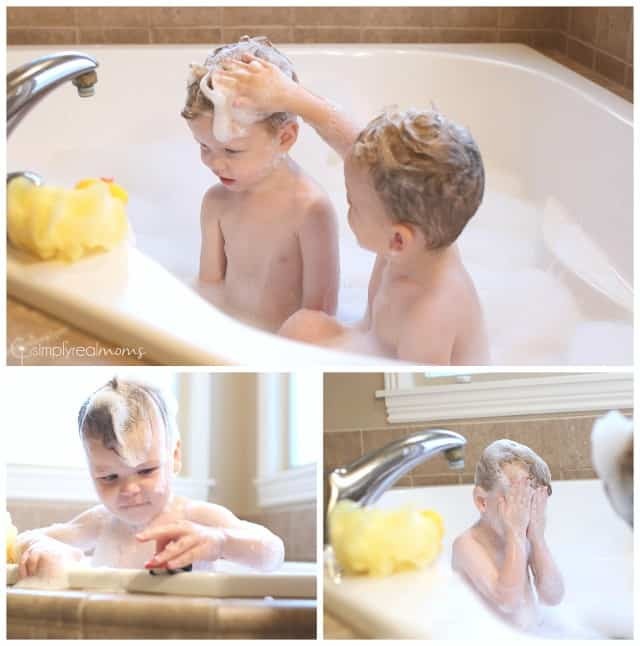 If your toddlers’ bath is shared with older siblings or yourself, be sure to remove things like adult soaps, shampoos and razors or keep them up high where they can be reached by little hands. A hanging shower organizer is a great way to keep these hazards up high! Your toddler’s skin is still sensitive and relatively new, so making sure you use products that care for their hair and skin the way you take care of them is important. 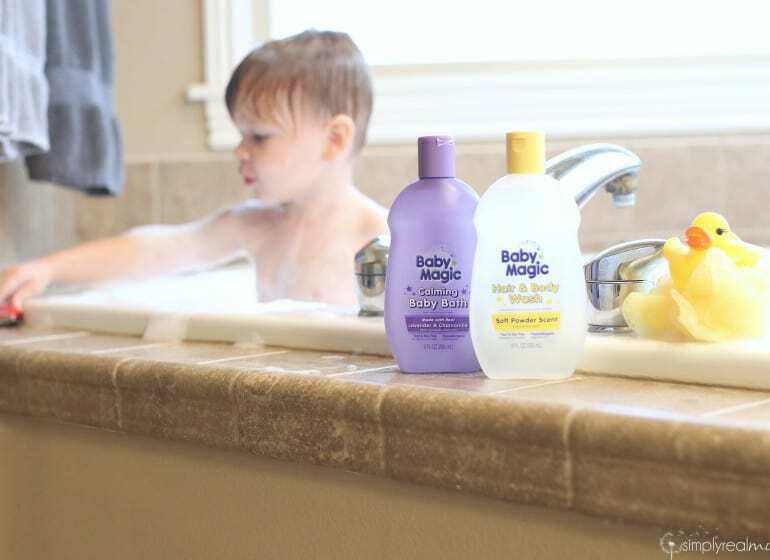 We love the products from Baby Magic because they clean my little ones without all the bad stuff and they’ve been a family owned business focused on making the best baby products for 65 years! Their baby washes smell amazing and are tear-free, paraben-free, hypoallergenic and dermatologist-tested to be the absolute best for even the littlest babies. Tear free is so important with active toddlers because the soap and shampoo gets EVERYWHERE when we wash them! We love using their Lavender line at bathtime because we tend to give baths in the evening before bed. The soft lavender scent calms my boys and prepares them for they sleep. Did you know that bath toys are a breeding ground for mold and mildew? If your bath toy has a hole in it, like squeeze toys and rubber duckies it’s very possible that there’s mold growing inside. When you buy toys, seal any openings with hot glue to keep them as safe as possible! Make sure that toys are rinsed after every bath and left to dry. Accidents can happen in the blink of an eye. Make sure that the time you set aside for bath time is just for that. Keep your phone close but not in your hand. Don’t leave the room-this is why preparation is important! If you happen to forget something, call someone from another room to come help. Interact and play with your toddler to keep it fun and engaging for both of you. I know I said earlier that my kids ignore the rules as soon as I’m not looking, but I repeat rules over and over and over. The rules are there for their safety and my peace of mind one day. They do hear you, I promise. They may not always listen but rules help kids to understand the potential dangers. I sing the rules to my kids and they remember them really well! When they start to break a rule I simply have to start singing the song we made up and they immediately fix the issue. Bath time is a great time to create fun memories and with all the right tools and preparation, your toddler will be safe and happy! This post is sponsored by Baby Magic. All opinions are our own. Good tips, I’d also suggest looking into limiting how far the bath handle can rotate using the Rotational Limit Stop, which are on many new bath handles. This prevents the water from getting too hot. That so much absolute advice you give and thanks for that. When my baby was 1 month I was so worried about his bath. At that time my mom was my helping hand. Now my babes 1 year complete and their many changes in bath strategy. For that, I am looking for something new on google and here is your post. I really love it. I agree with you, When it comes to newborn bath time, the utmost care is put into every detail to make sure our baby is safe, comfortable and that their new skin is carefully cleaned. Baby lotions, creams, powders, and oils are intended to moisturize the baby’s skin and soften it. Organic products contain non-ionic ingredients which are safe for baby’s use. 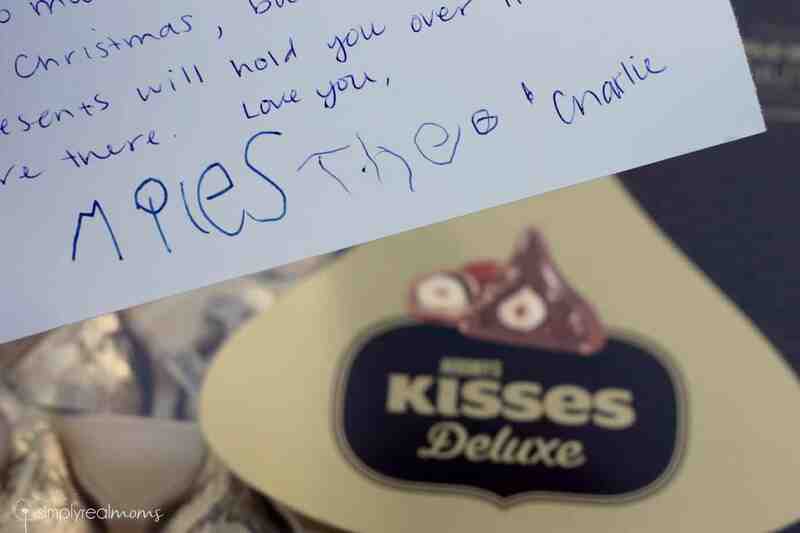 Thanks for sharing..! !